This is the third of a three-part post. See Music printing, a journey for engravers (part 1 of 3) and Music copying and confusion (part 2 of 3). As touched on in the previous post, roles and requirements are always changing. It is sometimes wondered, "why use a copyist? ", especially these days where software is user-friendly and results are easy. The answer, as has been for hundreds of years, is found in two words: time and expertise. Time - as mentioned in the previous post, composers have very tight deadlines and high demands on them. They call on copyists to prepare the music and have it ready on time. Any procrastination by the composer or others involved and it is the copyist who has less time, as they are the last step. This means copyists are often working through the night and even call in a team, to provide the music on time. Professional copyists work much faster and more accurately in preparing the music than say, the composer, will. Expertise - copyists have a huge knowledge of the rules of musical notation (including the exceptions to those rules and rules for the exceptions...), music theory, styles and conventions as well as the varying requirements and regulations for different orchestras and types of performers. All of this knowledge is called upon through the copying process to ensure music is correctly and accurately prepared. 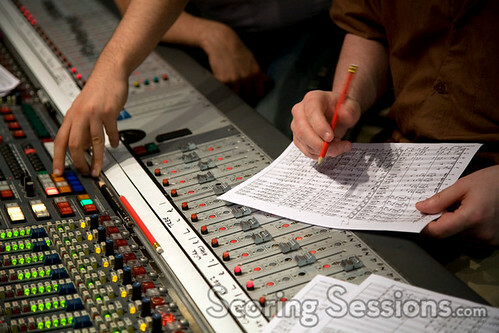 Orchestras booked for recording sessions, for example, cost massive amounts of money and when music is put on the stand moments before the session begins, it must be entirely proofread, have everything there correctly notated and be very easy to read. The role is always evolving. Currently, as well as composers creating handwritten and computer notated scores, there is software such as Logic, Pro Tools and Cubase. Composers and songwriters, perhaps sadly, don't need to have any knowledge of notation to create a masterpiece. The software produces MIDI files and copyists use that, instead of handwritten manuscripts, to create the notation. Obviously this process delivers the music to the copyist in a very raw state, so the demands increase. This is a very healthy trend and will keep copyists (or "music preparers") employed for many years to come, as no matter how it is created, the notated music always needs to get to the performers. If the performers are using digital music stands, their part still needs to be created. For many hundreds of years music has been notated, prepared and produced. Between the composer's pencil and a music stand exist engravers and copyists, those very hard workers. Their methods have constantly evolved and over the last century, their roles as well. What is still for certain is that there is more music than ever that needs to be prepared! This is the third of a three-part post. See Music printing, a journey for engravers (part 1 of 3) and Music copying and confusion (part 2 of 3).